Definition at line 132 of file regex2.h. Definition at line 155 of file regex2.h. Referenced by llvm_regcomp(), p_ere_exp(), and p_simp_re(). Definition at line 151 of file regex2.h. Referenced by categorize(), llvm_regcomp(), and ordinary(). Definition at line 158 of file regex2.h. Definition at line 140 of file regex2.h. Referenced by llvm_regcomp(), ordinary(), p_bracket(), p_ere_exp(), and p_simp_re(). Definition at line 136 of file regex2.h. Referenced by allocset(), firstch(), freeset(), freezeset(), llvm_regcomp(), nch(), and p_bracket(). Definition at line 142 of file regex2.h. Definition at line 144 of file regex2.h. Referenced by findmust(), llvm_regcomp(), llvm_regexec(), p_bre(), p_ere_exp(), and pluscount(). Definition at line 143 of file regex2.h. Definition at line 133 of file regex2.h. Definition at line 153 of file regex2.h. Referenced by findmust(), and llvm_regcomp(). Definition at line 152 of file regex2.h. Referenced by findmust(), llvm_regcomp(), and llvm_regfree(). Definition at line 148 of file regex2.h. Referenced by llvm_regcomp(), p_bre(), and p_ere_exp(). Definition at line 150 of file regex2.h. Definition at line 137 of file regex2.h. Referenced by allocset(), freeset(), freezeset(), isinsets(), llvm_regcomp(), and samesets(). Definition at line 149 of file regex2.h. Definition at line 156 of file regex2.h. Definition at line 141 of file regex2.h. Referenced by llvm_regexec(), and stripsnug(). Definition at line 154 of file regex2.h. Definition at line 139 of file regex2.h. 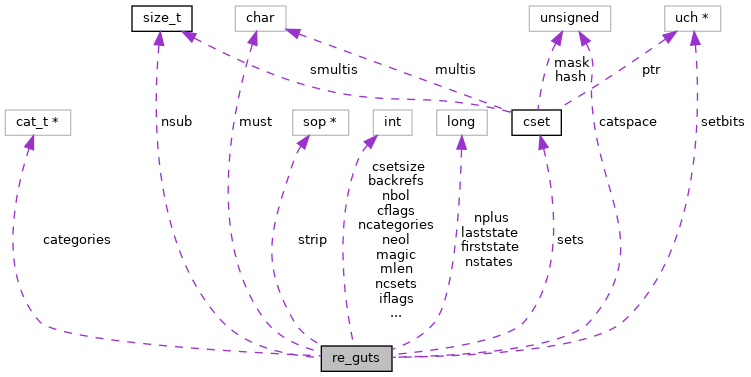 Referenced by allocset(), isinsets(), llvm_regcomp(), llvm_regfree(), and samesets(). Definition at line 138 of file regex2.h. Referenced by allocset(), freeset(), freezeset(), llvm_regcomp(), and llvm_regfree(). Definition at line 135 of file regex2.h. Referenced by findmust(), llvm_regfree(), pluscount(), and stripsnug().